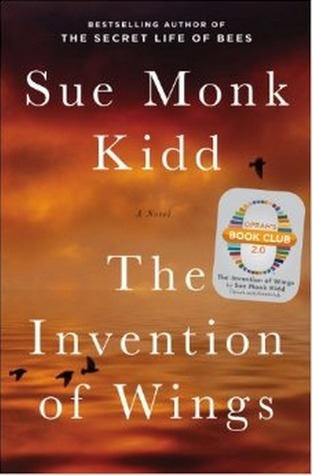 It wasn’t until the end of this audible book that I realized the Grimke sisters were not fictional characters but true abolitionists, that fact certainly made the story more impactful. One thing I truly enjoyed was hearing how Sarah discovered her purpose in life. Kidd does an excellent job on emphasizing this fact as Sarah walks through life. The sisters were truly infamous women leaders, paving the way for the abolition of slavery and invoking revolutionary thoughts on women’s rights. As I pondered their courage and accomplishments while listening to their story I was reminded of the line of scripture from the story of Ester when Mordecai says to Ester that perhaps God has brought her to the palace for a time such as this. Sarah and her sister Nina growing up in a southern slave owner’s home were exposed to the realities of slavery as young girls this upbringing shaped their viewpoint and when the time became ripe God launched their ministry. Don’t you just feel better now that you have read this? Have a great Monday. In my extended absence from my blogging chair a number of things have changed in my life, thankfully all of them good. One of the accomplishments reached during my absence has been the completion of my bachelor’s degree—yay me! At the onset of that journey I intended to complete that degree and roll right into a Master’s program to obtain my advance nurse practice degree, in other words, a nurse practitioner. So as I neared the end last December I began the search for the next school. I was so excited when I walked through the doors and into the wing of the nearly new medical building of a local university for an informational session, it felt like the perfect fit. In the spring I submitted my application and went for the interview and began the waiting process. Then the envelope finally arrived. I put it on the counter and walked away. I knew whatever was written on the letter was going to change my life. Getting accepted meant quitting my job, a job I loved, and going to school full-time. All the years of school, months of planning and I chose to wait some more. Finally I called my husband and told him, it’s here. Of course he asked, “what would that be”, the letter of course…you know the thing that I have been planning and working toward for years, waiting all these weeks to arrive. Oh, he said, well open it. I can’t, I told him. I know that no matter what those words say it is going to change my(our) lives. Of course he told me to stop being ridiculous and open the letter. So I did. My pastor and other bible teachers will tell you that God created “time” for us. We require the ability to break it down into smaller, bite size chunks. Imagine for a moment what the world we be like without “time”. A chaotic mess would exist, don’t you think? And time is a funny thing too I think. Sometimes it drags, like on a Friday work day. Other times it flies by; most weekends for instance. Earlier this week I was driving down a road that I last traveled on a beautiful sunny day last fall. As I passed by the location where I spent several hours on that October Saturday morning before heading off to meet a dear friend for lunch I thought to myself–that was 3 months ago already–yet in some sense it seems as though it was just last week. How about that eerie de’ja vue experience? I know it happens to all of us, right? 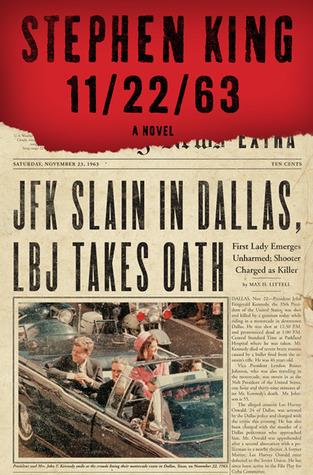 I just completed an audio book by the masterful storyteller, Stephen King, titled 11/22/63. The entire book is focused around an ordinary guy who goes back in time through what he calls a “rabbit hole” to right the terrible wrong that occurred when JFK was assassinated. He discovers however that when you change that past a whole new future is created, seems obvious huh? As the narrator reads the tale aloud I found myself reeling at the changes in the world since 1960. At one point the protagonist’s girlfriend asks about the future and he responds by telling her that a black man is president. She is stunned. This is before desegregation so to hear that less than 50 years in the future a black man would hold the highest office in the country was amazing. And it is, don’t you think? Time is weird. In some ways we can look back across the half a century and be blown away by the speed of progress yet when we look at the age of our now young adult children we can wonder…how did it go past so fast. 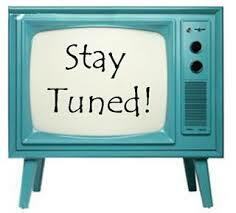 Today I am featuring a guest blogger from over at Black, White & Read. Hope you enjoy her writing and head over to her blog for a visit. I try to stay away from celebrities when it comes to talking about women in history and the reason is clear to me. Celebrities receive sensory overload in the media. They are the preferred “media darlings” and faces for the whole world to see while many “unsung heroes” are left behind–doing the magnificent, yet living out their lives in total or near-obscurity, mainly because they like it that way. They do what they do because they love it, not to get attention. However, there is a very special reason why this particular woman of the month is near and dear to my heart. Her name is Grace Dell “Nichelle” Nichols, and this Women’s History Month, I choose to celebrate her; not because of her celebrity, but because she played a very difficult role as a black woman on television. 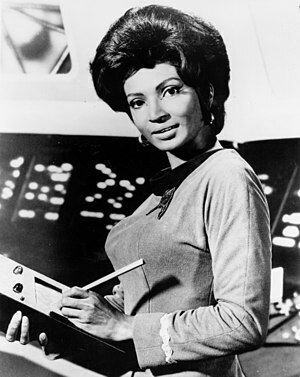 During a time in America’s history when black people on television were few and far between; when black women, in particular, were highly stereotyped (not that that has changed much); and when the unthinkable happened, and she (her character, that is) “kissed” Captain James T. Kirk on then-popular TV show, Star Trek. The whole nation went into an uproar over that infamous kiss, and it was said that Ms. Nichols actually received quite a few death threats because of it. The story goes that she (Lt. Comdr Nyota Uhura) and Capt. Kirk were actually “possessed” by some aliens who forced them to dance and kiss, but the backstory is that Hollywood was trying American audiences to see how far they could stretch the truth – that some white men actually fall in love with black women. In real life, however, it was a different story altogether. Ms. Nichols was not the only cast member of Star Trek who actually had no personal like of leading man, William “Bill” Shatner. It was a well-known fact that none of his co-stars cared for him very much off screen, and as Maya Angelou tells us in her book “A Song Flung Up to Heaven,” Ms. Nichols almost quit the show because of Shatner’s constant superstar-diva-type ranting’s. Ms. Nichols’ place in history is not only written in stone because she was one of only a hand full of women on television playing a non-stereotypical role that marked her as confident, capable, mature, and smart; but because when Martin Luther King, Jr. heard that she was going to quit the show, he phoned her, personally, and asked her to please stay. His words to her, paraphrased, was that she was a very important role model, and that her leaving the show would mean the loss of something very important to young black girls … that of seeing someone who looked like them depicted in a positive and professional light on television, a rarity back then, as it is now. As a matter of fact, she was not the “typical” female starlet, period. For that reason, this Women’s History Month, I choose to salute Ms. Nichelle Nichols. And to thank her for staying on the show, for keeping it positive for black women, and for all women, everywhere. She represented all the way around.